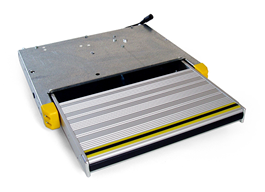 The Stayco W series cassette steps are suitable for small and medium size vans where there is a limitation on the space under the vehicle in which to mount a cassette step with a 300mm deep tread. 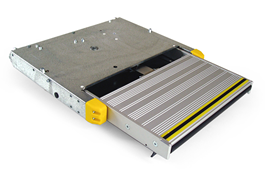 These steps have a tread depth of 260mm, but otherwise come with many of the same features as the Standard Series. The tread incorporates a soft rubber insert to the leading edge and a high grip yellow and black rubber strip along the top edge. The steps have high visibility protective corner covers and can be fitted with flashing corner warning LEDs and under tread lighting. Steps come with a twelve month on site warranty with the option to extend for a further year subject to an approved servicing schedule. Fitting kits for most popular vehicles are available. All the steps in this range can be optionally fitted with flashing corner warning LEDs, and ground illumination from under-tread lighting.